Walking through an art exhibition one day, a series of drawings caught me off guard. I stood amazed as if these works opened a secluded and peaceful space. I could momentarily withdraw from the many impressions filling the hall and looked especially at the large drawing pictured above. I found myself in a kind of sanctuary. There was tranquility, space, silence and an expectant tension. Calm of the Soul 5 instantly overwhelmed and fascinated me. This drawing is characterized by a calm motionless motion. The harmonious tangle of lines has shades of white, black, gray and some splashes of auburn. Before a form takes shape, it turns into something else. The fragmentation is both soft as silk and hard as steel. This fills the composition with tension. The figure is battered and hiding. But its core is still intact, recognizable in the beauty of its countenance. I look at it and think about the surprising, painful yet serene birth of wholeness and harmony. It is costly but unfolding. Examining this work I pick up melodies of pain, of searching, not knowing yet being content. I also hear a counterpoint of waiting and longing. As if the drawing pictures parts of a yet to be composed symphonic piece of music. The impressions are fragmented but harmonious. Looking at it I feel at home: known, loved, safe and above all: filled with longing and expectation. Even if life is difficult, full of hardship and sorrow, somewhere in the calm of my soul I know that I know that I know: all will be well. 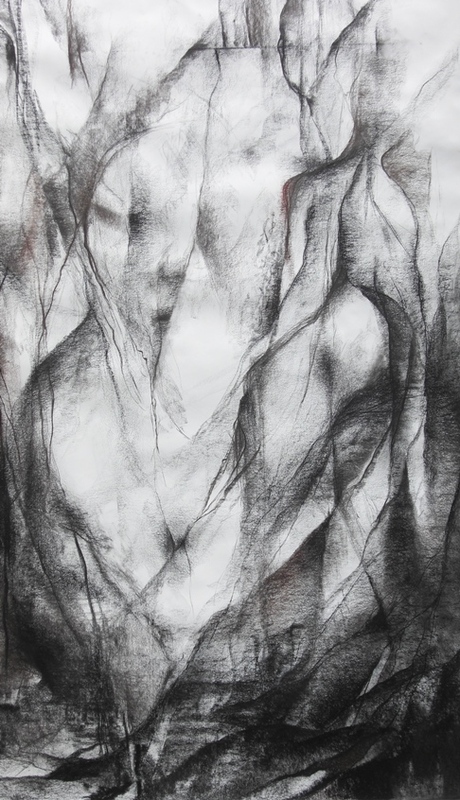 The Calm of the Soul project consists of 5 large drawings; 2015; charcoal, conté crayon and pastel on paper; 115 cm x 190 cm (3 x) and 98 cm x 150 cm (2 x). Maria Scherf has been trained as an art therapist at Academy De Wervel in Zeist, the Netherlands. Later on she abandoned the therapeutic side of her work, but held on to the artistic side. As a visual artist she makes paintings, drawings, sculptures, photos and videos. Her work is a search for the essence of life. She gives workshops in which art functions as an instrument in this search. Anikó Ouweneel is a cultural historian and art advisor who lives in the Netherlands. For more see www.visiodivina.eu.